As the UN approves the Global Compact on Migration (GCM) – the first global framework to comprehensively address issues related to the hundreds of millions of people in the world who change their country of usual residence – many migrants note that this may be a once-in-a-generation opportunity to lift up the rights and dignity of those on the move. At the same time, migrant groups have also pointed to a disconnect between the formal discussions of state-led international processes on migration vs. the immediate survival needs of those forced to leave their homes. For many, the most immediate need is finding a safe place to sleep and food for the day – not another international document signed by states. Karibu: What are the benefits of the Global Compact for Migration (GCM) and the Global Compact for Refugees (GCR)? And what is missing from these processes? Cecilia Jimenez-Damary: The GCM and the GCR are strong and important processes in that they recognize the rights of cross-border migrants in a clear and plain way. The aim of the two compacts is to protect the rights of those that are to leave their homes, compelled, forced or otherwise, and to move to another country, as well as to encourage national governments to collaborate for the rights of these persons. It is important here to mention the goal of the GCM and GCR is not to try to stop people from moving from their homes if they want or need to move. The Universal Declaration on Human Rights protects the freedom of movement. But if people are forced or compelled to leave their home, this is a whole different situation. We then need to prevent the conditions that force people to leave so that any mobility is, in essence, a voluntary act and not an act of desperation or even survival. The GCM and GCR aim to secure the human rights and dignity for those mainly forced to leave across borders. While the GCM and GCR takes steps towards the protection of cross-border migrants and refugees, they forget the invisible majority of those forced and compelled to leave their homes but remain within their country. By this, I am talking about internally displaced persons (IDPs). These are people that are not migrants (yet), or not legally recognized as refugees (yet). They include 60 million peoples who are forced to move within their own borders due to state and non-state conflict or violence, often being displaced for more than 20-25 years at a time in what we call “protracted displacement”, and other countless IDPs due to impoverishment, land grabs, climate change, slow onset disasters and drought, and extractive industries. The IDPs are often characterized by marginalization, vulnerability, poverty, and neglect. Karibu: To what extent are people that are forced to leave their homes thinking about or discussing international, state-led processes (like the GCM, CRM, and others) about their futures? Cecilia Jimenez-Damary:Here there is a disconnect. I do think that it is important to have an international process that concentrates on policy. However, for vulnerable people on the ground, their focus is of course on survival, especially during emergencies. While there is value in these international processes, there is rarely direct, immediate relevance. For example, the GCM was never actually meant to address the day-to-day survival of people. It was meant more to affect structure and policies that make these populations vulnerable. Now having said that, the ideal of these the GCM and GCR is to have a positive outcome for people on the ground, but whether or not these processes realistically help with day-to-day survival remains to be seen. I think if you look at the broad picture of this disconnect, it relates to the fact that it deals with two distinct issues: one issue is policy and one issue is survival. It is important that policy is eventually felt by the people, but the problem with the GCM, in my view, is that it did not really include the voices from the ground who are struggling for survival. We have included NGOs and civil society, but that’s the best we have. In terms of consultations of people on the ground, there has not been any bottom-up input to the official processes themselves. Karibu: You have made a reference to the disconnect between policy and survival within the GCM and GCR. Do you also experience this in your work as Special Rapporteur? Cecilia Jimenez-Damary:Yes, one example I could give on the disconnect for IDPs is related to the question of access to justice to IDPs. I think it is important to not take only a humanitarian lens, but also a justice lens. Our focus tends to be purely humanitarian, which is important, but it is incomplete – it needs to include justice to be comprehensive. Among many issues, I’ve been working on the question of IDPs and sexual violence. This question is not only tackled at the level of the person itself, but the policies and provisions that provide the negative opportunity for such sexual violence to succeed. There has been a lot of work with guidelines to prevent sexual violence, but that hasn’t trickled down to where the reality is on the ground. That’s a real disconnect. And why is that? It may be because everything that has to do with the guidelines and policies are so theoretical that it doesn’t address the real concerns of those on the ground. The victims of sexual violence are not always heard or taken seriously. We need to not only hear their voices, experiences, and concerns, but the cases need to go up to the policy level, since the objectives are both prevention and accountability. Karibu: How do you personally reconcile these tensions between the urgent needs of those most marginalized, such as IDPs, and the state-led international processes related to issues of people forced to leave home, in this case the GCM? Cecilia Jimenez-Damary: Well, first of all, I was not directly involved in the GCM. Yet, I found that the IDPs were left out, and the focus of the compacts was instead on refugees and migrants. It was hard to reconcile in my position that the two compacts did not discuss IDPs at all. IDPs remain in their own borders and so the responsibility to host them are their own governments. It’s a tricky situation, because most of the time you really have to demand the government protect its own people, generally, but especially with IDPs. For me, one of the main priorities, if not THE main priority, of the implementation of my mandate, is IDP participation. Without IDP participation, anything that happens, at any level, be it local in the camps, the community level, or the international level, the outcomes of the processes are questionable. So for me, one way that I reconcile the disconnect between international processes and the reality on the ground is to make sure that the vulnerable voices of those on the ground, the IDPs themselves, are up front and setting the agenda. It is the first message that I take with me in my mandate: IDP participation is essential. 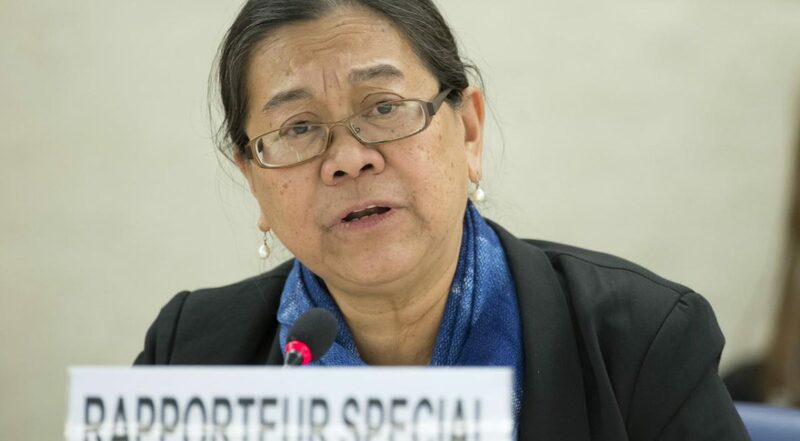 Cecilia Jimenez-Damary (Philippines) is a human rights lawyer specialised in forced displacement and migration. Ms. Jimenez-Damary has over three decades of experience in NGO human rights advocacy and also has teaching experience as an adjunct professor of international human rights and humanitarian law. She was appointed Special Rapporteur on the human rights of internally displaced persons by the Human Rights Council in September 2016. She can be reached at idp@ohchr.org.